Here are Ganesh Photos from Mumbai Ganesh Chaturthi 2018. 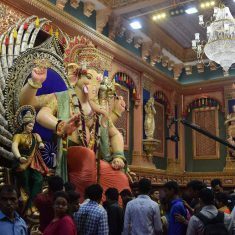 Nowhere in the world is Ganesh Chaturthi celebrated with as much fanfare and community spirit as in Mumbai. The people of Mumbai worship around 200,000 Ganesh Idols during the Ganpati Festival. 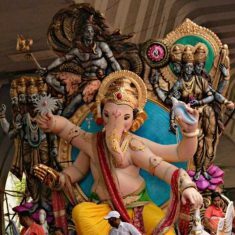 Over 95% of the Ganesh Murtis (Idols) are small and the balance are large Ganpati Idols worshipped in Community (“Sarvajanik”) Ganesh Pandals (temporary enclosure). 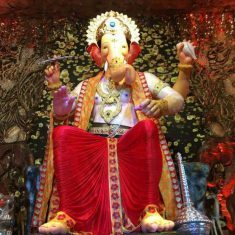 Below are 2018 Ganesh Photos of some of Mumbai’s most beautiful and famous Ganesh Idols and Ganpati Mandals. GANESH VISARJAN MUMBAI: This link has details of Mumbai Ganesh Visarjan (Immersion) Route, Location, Map. The Khetwadi Galli (Lane) 12 Ganesh Murti is known as “Khetwadi Cha Ganraj”. Mumbai has many large Ganpatis (especially in Khetwadi), which have great Ganesh Idols, but the Ganesh Pandal (enclosure) does not match the magnificence of the Murti. The “Khetwadi Cha Ganraj” has both, a beautiful Ganesh Idol and a wonderful setting (Pandal) around it. “KhetwadiCha Ganraj” has consistently been winning awards for best Ganesh Mandal in Mumbai. 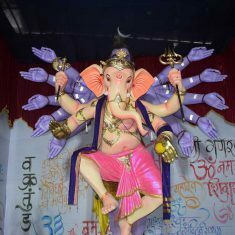 Raju Shinde is the sculptor of the Khetwadi Lane 12 Ganpati. The basic design and look of this large Ganesh Murti does not change much. Neither does the grand design of the “Khetwadi Cha Ganraj” Pandal, which looks like a room in a royal palace. Unlike previous years there is no first floor enclosure this year. “Khetwadi Cha Ganraj” is organized by 12th Khetwadi Sarvajanik Ganeshotsav Mandal. “Chinchpokli Cha Chintamani” Ganesh Idol is among the most famous Ganpati Murtis in Mumbai. Started in 1920, it is among the oldest Ganesh Mandal and Idols in Mumbai. 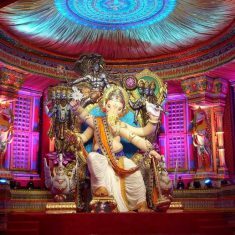 “Chinchpokli Cha Chintamani” is a combination of beautiful Ganpati Idol and a wonderful set (Ganesh Pandal). 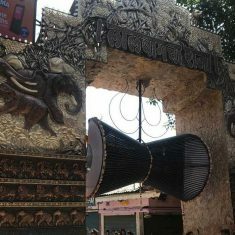 “Chinchpokli Cha Chintamani” idol is made at the Vijay Khatu Studio. Vijay Khatu was one of Mumbai’s most famous Ganesh Idol Sculptors. He passed away in 2017. This Chinchpokli Ganesh Idol is among the first big Ganesh Idols that is taken from the Ganpati Workshop. In a sense it heralds the start of the Ganesh Festival in Mumbai. The Chinchpokli Cha Chintamani “Aagman” (arrival) ceremony is celebrated with a lot of fanfare. Large number of devotees takes the Chinchpokli Ganesh home from the workshop to the Ganpati Pandal. “Chinchpokli Cha Chintamani” is organized by Chinchpokli Sarvajanik Utsav Mandal. “LalbaugCha Raja” is Mumbai’s most famous Ganesh Idol during Ganesh Chaturthi. It is the most visited Ganpati in Mumbai during Ganesh Chaturthi 2018. The Kambli family have been making the “LalbaghCha Raja” Ganesh Murti (Idol) since 1935. The basic design of “Lalbaugcha Raja” Ganesh Idol has not changed over the years. This is also one reason why it easily recognizable. For Ganesh Chaturthi 2018, the Lalbuagcha Raja Ganesh Mandal has extensively used monitors to display graphic designs around the Ganpati Murti. With the ban on thermocol and other polluting material, the organizers have used computer simulations instead. Over the years other Ganesh Mandals too may use this technology. For devotees there are two lines for getting “Lalbaugcha Raja” Darshan (blessing). There is a “Charan Sparsh” (feet touch) line and a “Mukh Darshan” (face seeing) line. Both lines are open 24 hours a day. 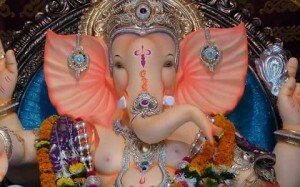 “Lalbaug Cha Raja” is managed by Lalbaugcha Raja Sarvajanik Ganeshotsav Mandal. The first “Lalbaghcha Raja” was installed in 1934. TIP FOR VISITORS: Since the “LalbugCha Raja” is Mumbai’s most visited Ganesh Idol, expect large crowds. A good time to visit is on days when individuals are busy with their own private or family Ganesh Idols. So the first and second days of Ganesh Chaturthi are relatively less crowded. Also the 5th day of Ganesh Chaturthi is less crowded because of “Gauri Visarjan”. 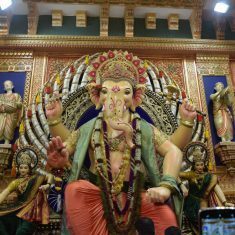 TIP: A short distance from “Lalbaug Cha Raja” is the famous Ganesh Galli Ganesh, which is popularly called “Mumbai Cha Raja”. Khetwadi Gali 11 Ganesh Murti is known as “Mumbai Cha Maharaja”. Every year it is among the more creative large Ganesh Murtis in Mumbai. For Ganesh Chaturthi 2018 the famous Ganpati sculptor, Krunal Patil, has made an interesting Ganesh Idol. “Mumbai Cha Maharaja” 2018 has his father, Lord Shiva, standing behind him. Mumbaicha Maharaja Ganesh Mandal has a mixed track record on the setting (Ganesh Pandal). 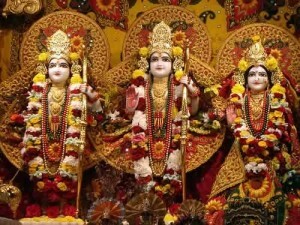 Some years the Pandal is beautifully decorated, and some years it is average. 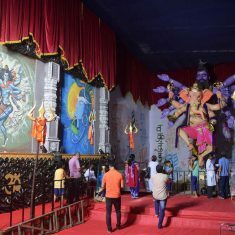 The 2018 Ganesh Pandal is nicely decorated, but could be better. Started in 1962, this is the 57th year of the “Mumbai Cha Maharaja” (Khetwadi Gali 11) Ganesh Mandal.